My Grandpa Bob passed away yesterday morning. He had been suffering quite sometime, and we all realize what a blessing it is that he is finally in a better place. I feel so lucky to have been his granddaughter, and I have so many great memories of growing up close to him. I love telling people who knew him that I am his granddaughter because they always have a story to tell about him. We will all miss him so much. Hey Mandy! You are in my thoughts and prayers with the loss of your Grandpa. Love you! I am so sorry to hear about your grandpa. I remember him always making people laugh! He was such a great guy! Your family is in our thoughts and prayers. 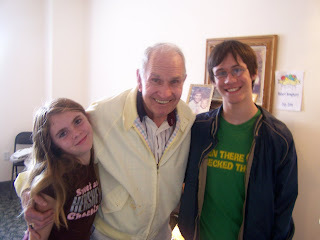 I love that picture of him w/ your kids, He was a great grandpa and I'll miss him greatly too. I heard about your attempt at going down for the funeral.. the weather was horrible! I love that picture of grandpa on your blog. He looks so happy. Isn't it funny the things we remember.. .like grandpa's motorcycle. I forgot to mention the tire swing in the back yard. I loved the house in Springville. That's fun that you get to see it a lot. I love your blog. It's so fun to keep up with each other. And, congrats on your 5k. I keep talking about starting a true running "hobby" but I have yet to attempt it. Sorry to hear about your grandpa passing away. Even though it was a blessing it is still hard to realize that they aren't here anymore. Take care!